The days of going to your friend’s house — like in this scene from The Sandlot (1993) — and asking if he or she wants to have a catch, throw a football or go for a run are long gone. Today, a simple text can do the trick. But even now that seems out of date. As Bob Dylan famously sang, The times they are a-changin. Now playing a pickup basketball, a round of golf or going for a jog with a partner can be arranged through an app. 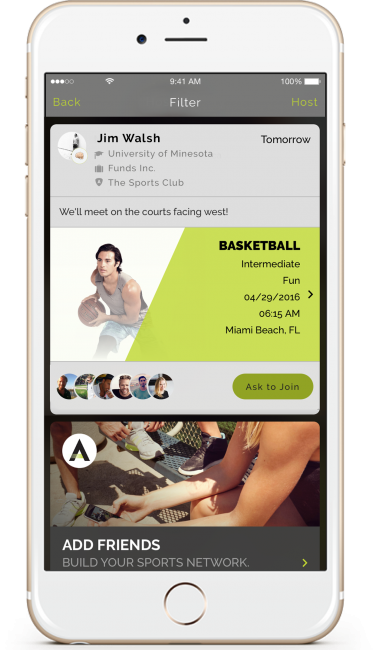 ATLETO helps users coordinate more than 40 different sports and workouts by interest, location and skill level. The app, which is available on iOS, Android and online, is used in a similar vein as dating apps. Users create a profile, select which sport(s) they are interested in playing and then browse nearby activities they can ask to join. If nothing piques their interest, users can host their own activity. Activities and events can be public for anyone to join, or private to remain just among you and your friends. ATLETO isn’t just for finding sports and activities in your own backyard, though. He said it comes in handy when traveling around the world as well to remain active and find like-minded individuals. “Sports or activities you do every day won’t be put on pause when you travel,” he said. Lundgren said he and the ATLETO team plan on taking the app to college campuses and businesses in the next 3-6 months, utilizing these markets as a way to connect students through pickup and intramural games, as well as getting co-workers out of the office to participate in activities together and exercise more. Dean Kremer travels to Israel each summer for a pair of reasons: to visit family and to promote baseball. This past summer, though, he was unable to go because of his own commitments with the Los Angeles Dodgers organization. Steve Zoumas has always been fond of remote-controlled objects — cars, trucks, planes, helicopters — you name it. So, it’s fitting his interest was piqued when drones came into the market. Zoumas, who owns a construction company in Long Island, N.Y., purchased his first drone to use while on job sites.